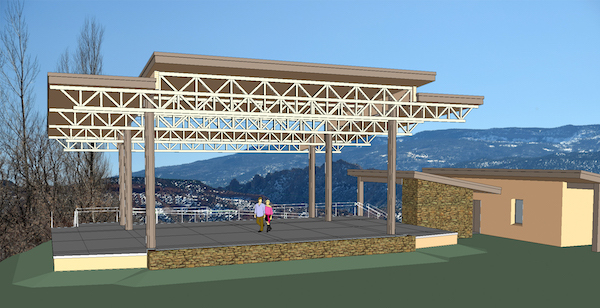 Check out this preliminary, SketchUp rendering of the new Entrada Performing Arts Stage. From symphonies, dance troupes, and outdoor plays to local music festivals, the Entrada Institute will be bringing a wide range of art and cultural events to Torrey, Utah. Please go to the http://www.entradainstitute.org/support/ website and consider making a donation to the stage fund to push us over the top. We’re currently at 91% of the way to our $475,000 goal. Or, chip in to support this year’s amazing line-up of events! Want to join in the fun? Participate in our fee-based, Strawbale Construction Workshop May 25-29, 2016. Workshop participants will be constructing the strawbale building to the right of the stage in the rendering. To learn more about our Capital Campaign, go to http://www.entradainstitute.org/support/capital-campaign/.